The Heritage Farms Quad Pod Purple Martin House Package includes everything you need to bring purple martins into your backyard birding sanctuary. After you finish assembling 4 levels of the rigorously tested Heritage Farms Quad Pod Purple Martin House, mount them on the included Quad Pod Pole System, and attach the 2 included Purple Martin Decoys to the included Purple Martin House System Top Perch to start attracting these birds right away. 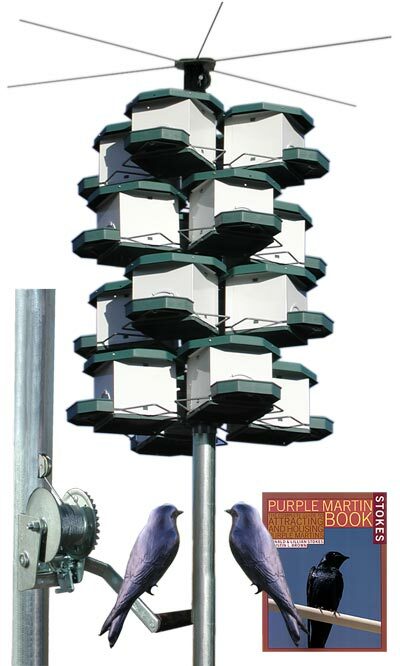 Once your new system is complete, the included Stokes Purple Martin Book will offer all the information you need to attract, house, and care for a colony of purple martins in your own backyard. The included Stokes Guide serves as the perfect reference book for the beginning to experienced purple martin enthusiast. This package is ideal for anyone just getting started with purple martins and is a great gift idea.